By default, when a customer enters their credit card details, they will be encrypted using an Internal Key. To decrypt cards encrypted using this key, simply leave the encryption key blank and PawBill will replace the blank key with the Internal Key. If you choose to encrypt the card details with an encryption key of your choice, that will be called a Custom Key. The Internal Key is provided as a convenience so that card details are encrypted from the time they are entered by the customer to the time you change the encryption type to a Custom Key. For security reasons, do not use the Internal Key to permanently store card details. 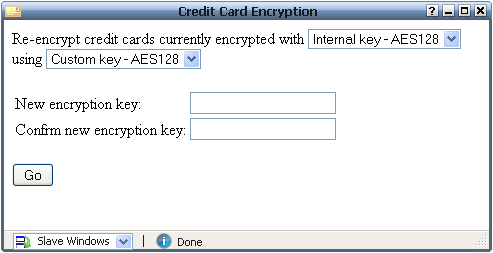 You should visit this window often and change cards encrypted with the Internal Key to a Custom Key. This caution does not apply if you use Stored Encryption Key as the card details will be encrypted using the stored encryption key as soon as the customer enters the card details. It shows the encryption key being changed from an Internal Key to a Custom Key. The encryption algorithm used is Advanced Encryption Standard (AES) 128-bit. The window is requesting the new encryption key to use to re-encrypt the card details. On clicking Go, all card details encrypted with the Internal Key will be decrypted and re-encrypted using the new Custom Key.